A man and a woman are accused of torturing animals with kitchen cutlery, household tools and shoes in footage sold to sexual fetishists. 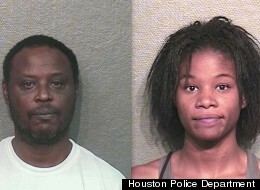 Brent Justice, 51, and Ashley Nicole Richards, 21, appeared in a Houston court on Monday to face charges surrounding the alleged animal cruelty caught on camera. Justice and Richards allegedly tortured a puppy, kittens, a rabbit, mice, a pigeon, fish, lobsters, crabs, and other animals using high heeled shoes, a meat cleaver, knives, screwdrivers, pliers, and other devices, the statement said. As many as 27 videos were seized. The Harris County magistrate judge reportedly “halted the reading of court documents” during proceedings last week because the details were too gruesome, The Houston Chronicle reports. Richards reportedly admitted to killing countless animals—up to two per day—over the years. She faces felony cruelty-to-animals charges: one for a video made in 2010 in which she binds and gags a kitten with masking tape and then stomps and crushes the animal, including putting her high-heeled shoe through the kitten’s eye, and for another video in which she kills a pit bull puppy by using a meat cleaver to hack off his leg and tail and a knife to slash his neck and cut into his leg. Justice faces a felony cruelty-to-animals charge for filming Richards as she killed the puppy with a knife. Each suspect faces a maximum of two years in prison for cruelty to non-livestock animals. Richards and Justice are being held on $40,000 and $20,000 bond, respectively, ABC-13 reports. You can thank the animal beta project for finding those fuckers! Same friends of mine that found out who luka magnotta was and were tracking him 🙂 I love this page keep up the great work! Those people are so disgusting. I am sickened at the crap they did. I hope they burn in Hell. They should be charged for the poor fish as well. we animal activists have to find the time to go online,join their sites & find these monsters that do crush videos.this is the only way we will find who they are to turn them in to authorities.